Fullerene Nanogears with multiple teeth being researched for use in space. In this historical photo from the U.S. space agency, the Numerical Aerospace Simulation Systems Division (NAS) of the NASA Ames Research Center, Moffett Field, California is conducting research into molecular-sized devices known as Nanotechnology. This photograph, taken on Apr. 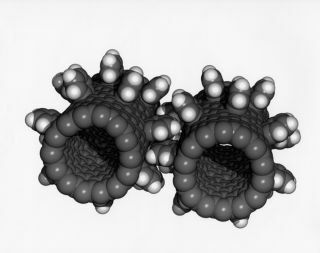 1, 1997, depicts two "Fullerene Nano-gears" with multiple teeth. The hope is that one day, products can be constructed made of thousands of tiny machines that could self-repair and adapt to the environment in which they exist. Researchers have simulated attaching benzyne molecules to the outside of a nanotube to form gear teeth. Nanotubes are molecular-sized pipes made of carbon atoms. To "drive" the gears, the supercomputer simulated a laser that served as a motor. The laser creates an electric field around the nanotube. A positively charged atom is placed on one side of the nanotube, and a negatively charged atom on the other side. The electric field drags the nanotube around like a shaft turning. Jie Han, Al Globus, Richard Jaffe and Glenn Deardorff are the authors of a technical paper detailing this technology which appears in The Journal of Nanotechnology.